Home > Article > Who polices the police? [T]he literature clearly establishes that a legally sanctioned law enforcement system existed in America before the Civil War for the express purpose of controlling the slave population and protect- ing the interests of slave owners. The similarities between the slave patrols and modern American policing are too salient to dismiss or ignore. Hence, the slave patrol should be considered a forerunner of modern American law enforcement (Turner, Giacopassi, and Vandiver 2006, 186). Today, the police continue to serve its historical political function. That includes the disproportionate killing of black males as well as subtler aggressions such as over-long response times to 911 calls in the black community. As I will argue in the conclusion, however, that iron fist is also reserved for the broader population affected by the economic decline and degradation of work currently happening across the country. The police question is a difficult one. But police excessive use of force is a reality, and it has become a public safety and health crisis. The question is whether there are just some rotten apples, rotten bushels, or a truly rotten tree—a corrupt system of policing connected to a broader dysfunctional criminal justice system and an unequal social structure. In this article, I try to sketch a picture of policing in the United States today. I will (a) discuss the structural underpinnings of police behavior, (b) propose a few individual-level factors that may contribute to police violence, (c) briefly discuss who is killed by (and kills) the police, and (d) last but not least, advance some recommendations to address, and hopefully reduce, police violence in the United States. I will pay particular attention to the much-debated question of body cameras. The current historical moment is marked by a massive polarization of wealth, which undoubtedly increases the likelihood of social conflict, particularly along class lines. In looking at Buffalo, where I live, Fisher has noted that of 32,598 black men over 16 years of age … only 18,361 are actually in the workforce …. Almost 6 out of 10 black men … are either unemployed or out of the work paradigm altogether…. In 1970, when almost 8 out of 10 black men were in the workforce [in Buffalo], almost 200,000 men and women worked in manufacturing. Today, when fewer than 5 of 10 black men are either in the workforce or employed, manufacturing counts for fewer than 50,000 jobs here. In Baltimore, where Freddie Gray was among the most recent and nationally known police murder victims, and where riots (Martin Luther King’s “voice of the unheard”) ensued, the same economic dynamics are at play. Baltimore lost over 100,000 manufacturing jobs between 1950 and 1995, 75 percent of its industrial employment—not to mention most of the jobs with union representation. Currently, only 6 percent of all jobs in the city are in manufacturing. The collapse of industry led to a number of changes in the demographic makeup of the city and the surrounding region, contributing to a crisis in urban poverty that lingers today. As factories bled manufacturing jobs, Baltimore bled residents: nearly one-third of its population left between 1950 and 2000. Businesses fled the city, followed by workers, and Baltimore began to lose its stature as the economic hub of central Maryland. By 1997, when the city’s population had shrunk to 657,000, Baltimore’s suburbs had grown from the 387,656 residents of 1950 to over 1.8 million inhabitants.Once the population center of central Maryland, by the end of the century Baltimore contained only a quarter of the region’s total population. Baltimore, like Buffalo, is just an example of what has been going on in the last few decades in inner cities throughout the United States, where a combination of deindustrialization, war on drugs, welfare abolition, and urban segregation has added fuel to the fire that is burning today. In this sense, the incidence of excessive use of force by white police against people of color is not a “recent uptick,” as suggested in The Buffalo News on December 8, 2014. Today’s racist police behavior is part of the deep legacy of racism in the United States, which often finds extreme expressions in law enforcement (a few cops have even belonged to the Klan) (1). It has been honed through years of aggressive policing and hypercriminalization of the black community. 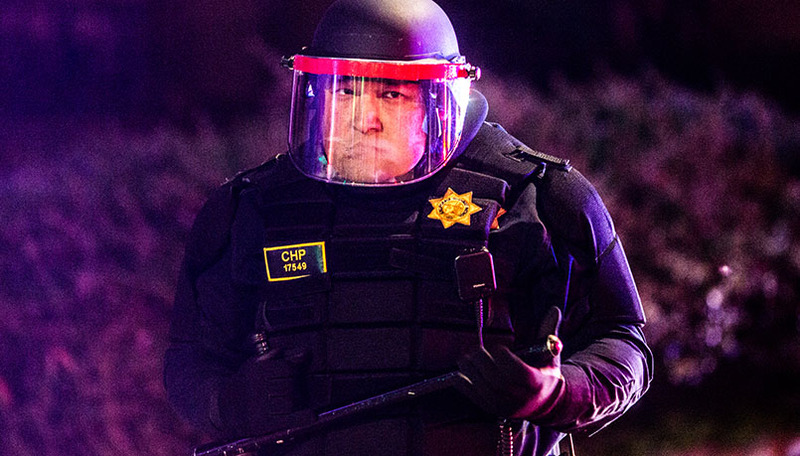 A pattern of generally aggressive and racist policing is common throughout the country. For example, there is a known problem of aggressive policing in Oakland, Los Angeles, and elsewhere; so much so that federal receivership or sanctions are either occurring or threatened in Oakland, Los Angeles, Cleveland and possibly also in Albuquerque (2). Baltimore has paid out $5.7 million since 2011 to settle 100 lawsuits “claiming that police officers brazenly beat up alleged suspects.” There is also an ongoing Department of Justice investigation of the Baltimore Police Department. Zero tolerance, or quality of life policing, is an additional problem in current police practice. Such approach leads to racial profiling and more intensive policing (but not real public safety) of communities of color, with drug arrests being the main component in the incarceration binge centered on youth. Washington, DC, Police Chief Kathy Lanier is highly critical of zero- tolerance policing,claiming that it has ruined positive relationships between police and those residing in high-crime neighborhoods. Lanier notes that neighborhoods that have the most homicides and shootings are also the neighborhoods that have the most victims and witnesses: “These are the people that can help you, that know what’s going. We destroyed that relationship, and they didn’t trust us. So we’re going back and completely undoing that strategy” (3). The arrest data show that overcriminalization disproportionately affects people of color. An excellent article in USA TODAY reviewed police arrest data reported to the FBI, showing that blacks are more likely than other racial groups to be arrested in almost every city for almost every type of crime. Nationwide, black people are arrested at higher rates for crimes as serious as murder and assault and as minor as loitering and marijuana pos- session. Arrest rates are lopsided almost everywhere. Of the 3,538 police departments examined by USA TODAY, only 173 arrested black people at a rate equal to or lower than that of other racial groups. It will take much to change the culture of police departments, many of which have opted to buy drones, deploy SWAT teams, and employ a toolkit relying on militarization rather than on community policing. With this ordinance in hand, their operations begin at a high level of violence, even when simply serving warrants, no-knock raids included. No-knock raids should clearly be outlawed for a number of reasons. Though the no-knock raid has been ruled legal by the courts (another aspect of the erosion of the Fourth Amendment), it stretches to the breaking point the intent of our existing laws. Since, by definition, no-knock raids require force to enter an apartment or house, they are like breaking and entering on steroids. And that is because the no-knock raid is just an excuse for police to use their military surplus weaponry and gear. It would be far more desirable for police to rely on traditional knock-and-announce warrant serving. Police recruitment efforts are designed to identify the candidates that are best able to complete their Academy training and who are most likely to perform at the highest levels of operational proficiency in the shortest time. Because of this focus, the Philadelphia Police Department actively recruits veterans of our armed forces for service in the Department…. We encourage all veterans to take advantage of this opportunity to join the Philadelphia Police Department, an agency dedicated to excellence and cutting-edge law enforcement leadership. We are defining the future of law enforcement in Philadelphia, we invite you to join us in making that vision a reality. On its face, is there anything wrong with recruitment from among veterans? Surely veterans are already trained for combat and committed to military solidarity, skills thought to be transferable to law enforcement. And, like so many others, vets need jobs when they return home. However, the violence that has accompanied the militarization of police forces raises important questions about the difference between police work and military engagement: whether policing should be seen as combat; whether the people police interact with are community members or potential enemies; and whether the preference for military training thwarts non-lethal approaches to law enforcement. With the killing of two police officers in New York City, Pat Lynch, president of the New York Patrolmen’s Benevolent Association (NYPBA), proclaimed, “There’s blood on many hands,” and allegedly added, in a memo, “For the 1st time in a number of years we have become a ‘wartime’ police department. We will act accordingly.” Of course it’s reasonable to ask Mr. Lynch who he thinks is making war on the NYPD: Mayor Bill de Blasio? Thousands of peaceful demonstrators protesting against a national problem of police brutality, racism, and use of excessive force and violence? And who, also, would Mr. Lynch like to make war on? While the deaths of those NYPD officers are tragedies, so too are the recent deaths of two Pennsylvania State troopers ambushed by Eric Frein. Frein, an experienced outdoorsman, is white; his victims were both white. Ismaaiyl Brinsley, who ambushed the two NYPD officers, was apparently mentally unstable, had a criminal history, and had shot his ex-girlfriend in Baltimore prior to killing those police officers. He is black. As one commentator at NYMag.com has put it, “this guy Brinsley, a clearly mentally unstable man with a criminal past is supposed to represent the avenging hand of people protesting police brutality and general injustice in cases involving Black people. [That would be like having] Eric Frein represent all outdoorsmen” (4). But judging by Lynch’s words, above, it’s not Brinsley, the individual, who is responsible for his actions. Lynch blames both a social movement focused on the fact that black lives matter and New York City Mayor de Blasio (whose wife happens to be black, and whose children are biracial). But Brinsley did not act as part of a social movement, or as an agent of Mayor de Blasio. He acted alone. It is not illogical to assume that if police persist in brutal behavior in certain communities, at some point someone may violently respond to the police. What is surprising is that in the 395 years since people were first brought here from Africa, and considered in light of slavery, Jim Crow, the New Jim Crow, and persisting structural and cultural violence, individuals such as Mr. Brinsley have been rare. Law enforcement deaths are generally well publicized in the media. And there is no paucity of statistics on police killed or injured in the line of duty. However, Paul Takagi’s (1974) groundbreaking research on this question showed that the occupational fatalities in law enforcement fell well below those in mining, construction, agriculture, and transportation. In fact, per a 2013 Bureau of Labor Statistics (BLS) report, policing does not rank among the top ten most dangerous occupations. As the BLS indicates,the following occupations had the highest annual fatal work injury rates in 2013: logging workers, fishers and related fishing workers, aircraft pilots and flight engineers, roofers, refuse and recyclable material collectors, mining machine operators and mineworkers, driver/sales workers and truck drivers, farmers, ranchers, and other agricultural managers and workers, electrical power-line installers and repairers, and construction laborers. By way of comparison, statistics released by the FBI show that 27 law enforcement officers were feloniously killed in the line of duty in 2013, a decrease of more than 44 percent when compared to the 49 officers killed in 2012. By region, 15 officers died as a result of criminal acts that occurred in the South, six officers in the West, four officers in the Midwest, and two in the Northeast…. An additional 49 officers were accidentally killed in the line of duty in 2013.This total represents one officer more than the 48 officers who were accidentally killed in 2012. By region, 31 officers died due to accidents in the South, nine in the West, five in the Northeast, and four in the Midwest. It should be noted that of the 27 law enforcement officers’ felony deaths in 2013, 15 of the perpetrators were white, 11 were black; 20 of the alleged offenders had prior criminal arrests. Contrary to racist criminal stereotypes played up by the media, cop-killers are just about equally black and white. And also those with prior criminal arrests are equally divided between blacks and whites. There is a growing concern about ambush killings of law-enforcement officers by members of white right-wing terrorist groups such as sovereign citizens, christian dominionists, and patriot and militia groups or their sympathizers. Most of these ambush killings are perpetrated by people who look more like Eric Frein than like Ismaaiyl Brinsley. It is interesting, and perhaps disturbing, that when I googled “race of police ambush killers 2014,”or “white ambush killers of police 2014,” the first ten selections were only about Brinsley and the two NYPD officers he killed. Yet, in point of fact, 13 of the 15 ambush killings of law enforcement officers in 2014 were perpetrated by white people. In looking at the data on deaths by occupation, fairness requires acknowledging that law enforcement is the only occupation in which carrying a gun and confronting potential violence is part of the job. Moreover, many police work in high crime areas. Regardless, none of these excuses warrant excessive use of force and violent racist and sexist behavior, which often amounts to outright hostility to the very communities police are supposed to serve and protect. Who gets killed by police officers? The national record-keeping of killings of civilians by police is not uniform, accurate, or systematic. In sum, it’s just plain inadequate. The FBI’s Uniform Crime Reports track justifiable police homicides. There were 1,688 from 2010 to 2013, or an average of 400 civilians killed each year between 2008 and 2012. Yet the statistics rely only on voluntary reporting by law enforcement agencies and are incomplete. Circumstances of death and other information such as age and race are not required. Efforts are under way to give a fuller picture of what is happening on the ground in the United States. The Center for Policing Equity has begun work on creating a policing database, with funding from the Department of Justice, the National Science Foundation, and private groups. The initiative will monitor not only deaths but also all police stops and uses of force. But even now, the Washington Post has delved much deeper into this issue. In a recent article, the Washington Post has shown that 385 people were fatally shot by police in the first five months of 2015 alone, averaging 2.6 fatalities per day. At this rate, deadly police shootings of civilians will exceed 1,000 for 2015. The Guardian also maintains a tracker of civilians killed by police. The rate of 2.6 civilian fatalities per day is more than twice the rate offered by the FBI and mentioned earlier. And police are seldom, if ever, found guilty of killing civilians. Of the conservatively estimated 4,000 civilians killed by police between 2005 and 2015, only 54 officers were charged for fatal shootings while on duty. Of that number, 35 have had their cases resolved. Of those, a majority—21 officers—were acquitted or saw their charges dropped. The data show that the problems encountered with police violence are systemic, not merely a case of individual “bad apples.” Although most of these bad apples seem to be white, black police may also commit acts of violent aggression against civilians, including black civilians. This may have a good deal to do with the inward-turning culture of the police and their professional socialization. Ultimately, however, police supervisors are responsible for the actions of their individual officers. So it is reasonable to ask: what will they do to combat this epidemic of police violence? A real reform of the police can only happen in the context of broader programs dealing with basic issues of poverty, living wages, housing, and fully funded and fully staffed public education. Nevertheless, a comprehensive series of measures combining decriminalization of minor offenses, demilitarization of the police, implementation of community policing, police retraining, and increased accountability might help improve police practice in our cities. Below are some recommendations. Eliminate “stop and frisk”. Stop and frisk is fundamentally organized around racial profiling and is It must be eliminated. Decriminalize marijuana arrests. The criminalization of minor drug offenses, a pillar of a decade-long war on drugs, has proven to be ineffective and has disproportionately affected black marginalized coA study investigating differential marijuana arrest rates by race in 700 United States counties found that “in 64 percent of these counties, the black arrest rate for marijuana violations was more than twice the arrest rate for whites” (5). Demilitarize the police. The war-zone firepower embodied by the police, like the one so strongly and frighteningly displayed in Ferguson, is unacceptable. And wherever police are militarized in our country we may speak of occupied territory. Enact community policing. Police and those they serve must find common What is needed are better interactions between the police and the communities they serve. Both police and those communities need to see their common interests in building a public safety model that really does make communities safer. Implement and enforce residency requirements. Police departments should enforce residency requirement to ensure that at least a sizeable portion of its officers reside in the city where they work. Train officers in de-escalation and conflict resolution. Police need to take on-the-job de- escalation training, and also attend mandatory classes on racism and sexism: what they are, how they operate, and how to combat them—in themselves and in others. These classes must be fully integrated into regular police academy training and college criminal justice programs as part of required curricula, rather than as stand-alone workshops. Police must be required to successfully complete these classes and other courses on in-depth conflict resolution in order to graduate from the academy and continue their employment as cops. Such classes should be comprehensive and be taken by all cops on a regular schedule—for example, every two years. Role playing is a good device to use in the classes. Prosecutors and judges should have to take these classes, too. In police training and retraining, there should also be a strong emphasis on non-abusive restraint techniques. Implement regular psychological testing. All police should undergo regular, periodical psychological Given the possible bigoted attitudes of which law enforcement officers may be completely unaware, police should also be tested using the Implicit Association Test (IAT), which assesses racial bias. Both psychological testing and the IAT should be administered to police officers every three years during their first 10 years on the force. Increase minority and female police hiring. Police diversity must be broad. Its first long-term commitment must be the hiring of more African American, Hispanic, Native American, and female officers. Given the data on white and to some extent even minority police violence against civilians, diversity alone, much like body cameras (see below), may not solve the complex problem of a police culture of excessive force, violence, and aggression. But it is certainly an advance. It might also be helpful to hire bilingual or multilingual officers and/or equip them with hand-held oral/aural translation devices to facilitate communication with non-English-speaking individuals. Revise police promotion criteria. Virtually all police departments have explicit promotion But there are also unwritten promotional criteria such as number of arrests, traffic ticket quotas, stop-and-frisk encounters (particularly in the NYPD), etc. By contrast, if police promotions were linked to community policing, we might expect a serious focus on criteria such as reduced crime rates on officers’ assigned beats. Restrict the role of police unions in excessive force complaints. Police unions, like internal affairs divisions, cannot be relied upon to overcome the code of silence or cross the “blue line” to end chronic police violence. At times, the culture of some of these unions may exhibit racist sentiments and also hostility to administrative authority. It is unwarranted to allow complaints about police excessive uses of force, including those resulting in the death of a civilian or civilians, to be addressed solely within the collective bargaining process. Appoint independent prosecutors. In the legal system, district attorneys work too closely with the police to be neutral in cases of police abuse or excessive use of force. District attorneys are often also beholden politically to police unions for electoral support, and city power structures consistently stand behind the police Consequently, independent prosecutors must be appointed by the state attorney general in every case of police use of excessive force or death of a civilian. Establish civilian complaint review boards. An independent civilian review board must be created to review all police incidents of use of excessive and deadly force. This board must have subpoena power and must be able to review all police body camera and dashboard camera footage. As Frank Serpico recently observed, we need publicly funded, independent boards to review incidents of police corruption and brutality. Typically, police unions close ranks behind the officer in question when shootings of civilians occur. Police department internal affairs investigations also lack the necessary independence. Bar officers facing indictment from testifying before grand juries. Because grand jury proceedings are not a trial to determine guilt or innocence, police should be barred from presenting exculpatory evidence before a grand jury that may indict them (6). Create databases on excessive force events, resisting arrest charges, and police stops. In 2009, in New York City “just five percent of officers who made arrests accounted for 40 percent of resisting arrest cases—and 15 percent accounted for almost 3/4 of such.” The majority of such cases involve minorities. To avoid similar discriminatory practices, police departments should keep a detailed database on officers making resisting arrest charges. It may also be advisable to expand this database to include excessive force events and police stops. The entire database should be publicly available. Minimally, the database should be available to the civilian complaint review board proposed above, which might also help in constructing such databases. Establish a national police job performance database. Since police officers may fail and/or be fired in one jurisdiction but go on to secure employment in other jurisdictions, a national police job performance database is necessary–as we saw in the case of Tamir Rice (7). Are body cameras the solution? On balance, requiring all police officers to use body cameras appears to be an advance that would benefit both civilians and police. However, there are certain complexities surrounding the body camera question that should be considered. A small, single police department study in Rialto, CA, suggests that the wearing of body cameras has resulted in a reduction of aggressive anti-civilian police behavior: “The findings suggest more than a 50 percent reduction in the total number of incidents of use-of-force compared to control-conditions, and nearly ten times more citizens’ complaints in the 12-months prior to the experiment” (8). The ACLU, although uncomfortable with the increased use of video cameras to record interactions with citizens, acknowledges that such cameras can reduce the number of use-of-force incidents and will yield better law enforcement accountability to the community. Indeed, the entire 7,000-member Los Angeles Police Department will soon be equipped with body cameras. President Obama asked Congress for funding to buy body cameras to record events like the shooting death of unarmed 18-year-old Michael Brown. They plan to spend $263 million to increase use of body-worn cameras, expand training for law enforcement, and add more resources for police department reform. On its face, this seems to be a good idea. Of that total, $75 million would help to pay for 50,000 small lapel-mounted cameras to record police on the job, with state and local governments paying half the cost. But is this latest technological fix really the answer to police violence and aggression toward civilians? Or is it, like Tasers and sound canons, just another short-term solution to a long-term problem? Recent federal government reports estimate the number of sworn law enforcement officers in communities across the United States to be roughly 700,000. Even if all 700,000 were compelled to wear cameras and were not able to cease automatic recording of police-civilian incidents, this remains a technocratic approach to a much more profound social problem. Police may soon recognize that that the cameras are documenting only their own perspective, while perhaps ignoring other elements that contributed to the conflict or non-conflict. They may inevitably try to stage-manage events in favorable ways, while maintaining the perception of an objective record. From this point of view, civilian cell phone cameras may actually provide fuller pictures of what’s going on. However, police have often blocked or attempted to block public video/audio recording of their actions during violent encounters with civilians. Ramsey Orta, the man who taped the death of Eric Garner, was subsequently arrested and indicted on a weapons charge. Was his arrest and indictment retribution for filming Eric Garner’s death? Texans have a First Amendment right to record police officers in public places as they perform their duties. Many high-profile incidents of police abuse, like LAPD officers’ beating of Rodney King, would never have been exposed to public scrutiny but for the citizen journalists on the scene who dared to record conduct that they believed was wrong.HB 2918 would deprive us of an important check against abuse of power by the police. Police body cameras may well work against, not for, civilians. With such tools in hand, police might seek “increased regulation of private civilians’ ability to record and disseminate videos of police actions, a long-contentious issue for law enforcement. Why should civilians record police when police can do it themselves?” (Carlson 2014). Distaste for videoing their own actions has sometimes led police who have used cameras to turn them off at crucial moments (9). It is known that from time to time during inmate cell extractions, while inmates get beaten, surveillance camera batteries seem to run out.For example,Charles B.Clarke III died at the Georgia Diagnostic and Classification Prison, quite possibly from a beating by corrections officers when he was extracted from his cell: “The videotape … ends before Clarke is injured, a common ploy used by prison guards who want to exact retribution during a use of force incident. [One of the corrections officers involved in this cell extraction] claimed the tape ended because the camera’s battery had died” (10). Might the same thing happen with body cameras? It is also worth considering that in the hands of racist, sexist, or violent police, body cameras will be videotaping people who may simply be arguing on a street corner, or maybe even trading marijuana joints. Will they get busted? If smoking marijuana is illegal, and police see such behavior, they may be required to make an arrest. Consequently, body cameras might actually mean more arrests over fewer violent interactions and, therefore, a potential increase in America’s already unacceptable incarceration rates. Therefore, one major downside to police use of body cameras is an even more ubiquitous surveillance. Body cameras may actually come to represent a further infringement or intrusion on personal rights, civil rights, and human rights: “Outfitting law enforcement with body cameras may also backfire on those it’s meant to protect: people in poor communities, people of color, people in high-crime areas. Privacy may well be a thing of the past, but the erosion of privacy is not distributed equally across society” (Carlson 2014). How, for example, may racist police deal with domestic violence situations? Will police then be videoing civilians in their own homes? And what about kids with toy guns in minority communities, or BB guns like Tamir Rice? In the absence of their own commitment to and practice of antiracist behavior, why should we think that police would change their behavior simply because of the technological fix of body cams? They already have dash cams—how much has that changed their behavior? Although, as the police murder of Samuel Dubose has shown, body cameras can be useful in surfacing truth against police lies and cover-ups, the use of body cameras in the absence of antiracist and anti-aggressive police resocialization may well leave racist and/or violent police behavior unchanged. As we have seen so far, excessive force in policing is generally aimed at poor and working people, and it has a specific racial dimension. The police do seem to protect and serve middle-class communities—and the rich. Indeed, most middle-class white people have infrequent interactions with the police; and when they do, those encounters rarely result in criminal records, incarceration, or police violence. Moreover, it is undeniable that the epidemic of police and vigilante shootings and killings clearly targets black males. However, the structural conditions that underpin policing—poverty, lack of social services, poor health care, insufficient education, and lack of meaningful, well-paying jobs—also exist in many poor and working-class white communities. To date, white communities have generally been less prone to the type of focused, violent, and aggressive policing that communities of color have experienced historically. However, some poor and working class whites are also increasingly experiencing violence or death at the hands of police. Consequently, these communities are natural allies to the current movement to end police brutality. That hurdle must be overcome through mutual aid and reciprocal action.The reform proposals I have outlined above cannot produce any meaningful change in the absence of a broad movement addressing the deep foundations of structural and cultural violence in the United States. I wish to thank Marvin Berlowitz,Harper Bishop,Mary Ann Castle,Gregory Shank, and Bruce Jackson for their helpful suggestions and insights during the development of this article. This article was first published in Social Justice, 43:2 (2016). The author, Dr. Gene Grabiner, is SUNY Distinguished Service Professor Emeritus. It appears here, in an edited version, by permission of the author. 2014 “Body Cameras Aren’t Going to Fix Policing.” Los Angeles Times, December 13. 2006 “Structural Violence and Clinical Medicine.” In Social Medicine in the 21st Century Medicine, edited by Samuel Barrack, pp. 30–35. Wilmington, DE: Internet Medical Publishing. 1998 History of the Labor Movement in the United States. Vol. 2: From the Founding of the A.F. of L. to the Emergence of American Imperialism (2nd ed.). New York: International Publishers. 1969 “Violence, Peace, and Peace Research.” Journal of Peace Research 6(3): 167–91. 1990 “Cultural Violence.” Journal of Peace Research 27(3): 291–305. 2000 United States Marijuana Arrests, Part Two: Racial Differences in Drug Arrests. Washington, DC: The NORML Foundation. 1971 Selections from the Prison Notebooks of Antonio Gramsci (trans. Quintin Hoare, Geofrey Nowell Smith). New York: International Publishers. 2009 On Killing: The Psychological Cost of Learning to Kill in War and Society. New York: Back Bay Books. 2012 “On the Epidemic of Police Killings.” Social Justice 39(4): 52–75. 2011 “Structural Violence, Historical Trauma, and Public Health: The Environmental Justice Critique of Contemporary Risk Science and Practice.” In Communities, Neighborhoods, and Health: Expanding the Boundaries of Place, edited by Linda M. Burton et al., pp. 203–18. New York: Springer Science & Business Media. 2009 At War with Metaphor: Media, Propaganda, and Racism in the War on Terror. Lanham, MD: Lexington Books. 1974 “A Garrison State in a ‘Democratic’ Society.” Crime and Social Justice 1 (Spring-Summer): 27–33. 2006 “Ignoring the Past: Coverage of Slavery and Slave Patrols in Criminal Justice Texts.” Journal of Criminal Justice Education 17(1): 181–95.